When you think about picnics, you might picture summertime celebrations with warm, sunny weather, collections of extended family members, and burgers sizzling on the grill. Unless those burgers are veggie patties, however, vegetarians and vegans need to either fill up on side dishes or bring their own munchies. Not so with a vegetarian picnic menu! Whether just one or everyone from your family follows a meatless diet, you can prepare and pack a tasty spread that has no need of burgers or hot dogs. Finding portable, meat-free main dishes isn't hard. You can always fall back on packaged meat substitutes, if you're in a hurry or are dealing with picky eaters, but if you're willing to put in just a few extra minutes for preparation, you can pack up a meal that's truly spectacular. Fix and pack any of the following for a main meal that offers a tasty balance of carbs, protein, and healthy fats. Grilled Tofu Sandwiches: Tofu stands in for meat beautifully in a grilled sandwich. If you have the time, marinate thick slices ahead of time so they develop more flavor. Don't stop with just the tofu, though. Cut eggplant, zucchini, red bell peppers, and Portobello mushrooms into thick slices and grill them as well. Assemble your sandwiches on fresh, crisp baguettes and add some protein with a slice of cheese before serving. Tossed Salad: Salad is usually thrust into the background as a side dish, but it has the potential to shine as a main menu item at any vegetarian picnic. On a scorching hot day, a refreshing green salad with hard-boiled eggs, feta cheese, and watermelon squares will hit the spot; if you're a little hungrier, make up a creamy egg salad and serve it with slices of whole-wheat bread and fresh lettuce leaves. Quiche: Quiche is an ideal make-ahead dish for a picnic lunch or supper. It's fantastic served hot, cold, or at room temperature, and it's not fussy to store or transport. Just bring a knife, cut the pie into slices, serve, and enjoy! Veggie Platter: Often, there's nothing more satisfying than indulging in a European-style meal based on just bread and cheese. Get a large, crusty baguette to pack, and supplement with a variety of fresh or grilled veggies, wedges of cheese, and dried or fresh fruits. 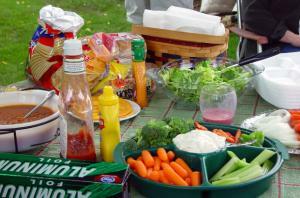 Part of the fun in having a picnic is offering a big spread of food, including a variety of tempting side dishes. Grain Pilaf: A pilaf is easy to make with whatever you happen to have around the kitchen. Just cook up a fresh batch of grains, such as rice or quinoa, let them cool, and mix in cheese cubes, dried fruit, sauteed veggies, garlic, spices, and herbs. Fruit Salad: Watermelon is the staple fruit salad ingredient of a summer picnic, but you can jazz up the side by tossing in fresh grapes, berries, apple, other types of melon, fresh mint, or sweet cheese. Chips: One of a picnic's most perfect snack foods, chips go fantastically with almost any main dish. You can use the packaged variety or make healthy kale chips or veggie chips on your own and pack them ahead of time. Besides bringing the essentials of silverware and napkins, think about what you can pack so no one will miss the meat. Desserts: Homemade chocolate-chip cookies, scones, or just fresh slices of watermelon cap off an outdoor meal nicely. Drinks: Some veggie juice or individually portioned smoothies, perhaps? If not, fill up your glasses at the park's water fountain or bring a pitcher of lemonade. Cooler: Keep all of those fantastic fruits and vegetables chilly during transport with an ice-packed cooler. Coolers also help cut the risk of food contamination by keeping your meal cold until it's time to eat. Trash: Just in case the picnic grounds you go to don't have waste cans, you'll need a plastic bag in which you can stash your trash. 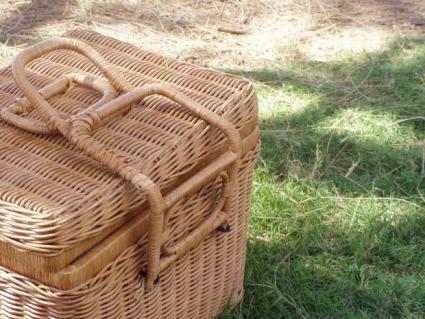 The weather is just too beautiful to stay inside sometimes, so pack a basket with your favorite tasty treats, grab your family members or friends, head to the park, and start munching.